I’m going to start a new feature here called “Cloud Nine”, which will showcase things that I think are awesome or that have made me happy. I’m looking at making this a weekly feature, but no promises to that regard. Yes, there are zombies. Yes, there are elements of Alice in Wonderland. No, this is not Alice in Wonderland with zombies thrown in. Although a book like that does exist (Alice in Zombieland by Nickolas Cook – I don’t recommend it). 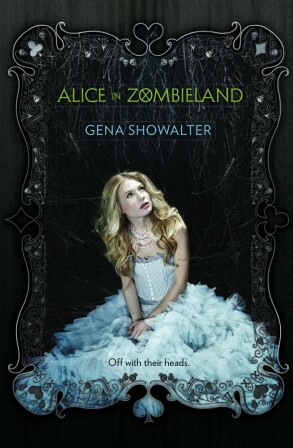 Gena Showalter has put a fresh spin on zombies and Alice, much to my delight. I originally found this book, after reading the other Alice in Zombieland, and picked it up hoping that it would be more of the book I wanted to read, rather than the one I actually read (can you tell I was not impressed?). This time, I wasn’t let down. Although it’s based on Alice in Wonderland to a degree, I’ll be honest with you – I can’t pick out most of the counterparts. Obviously, there’s Alice. Her best friend is Kat, so that one wasn’t hard. And then, at least in my mind, Cole is the Hatter. Other than that I’m not sure who would be who. And the really great part is that it doesn’t matter. This is a story built on its own foundations, and even if you had never heard of Alice in Wonderland, it would still hold up. The zombies are even better. They’re not your typical undead-eat flesh-shambling killing machines. In Alice’s world, most people can’t see zombies and have no idea they even exist. These zombies exist in the spirit world, which makes for an interesting way of dealing with and fighting them. People in the physical world are still in danger, only they have no idea what that danger is. Alice and her friends are a group of slayers, who have the ability to fight the zombies in their natural habitat. This ability is something that, while not rare, is also not rampant among the population and sets them apart. Alice in Zombieland is also a young adult novel, so the main characters are all teenagers. With teenagers comes a certain degree of angst, but it’s handled well here. I also find it believable for the most part, rather than overblown. The teenagers act like teenagers, but they’re still fully realized people. Being a teenager is only one aspect of their lives, and the typical tropes aren’t taking over the story even if they do show up. That being said, I do have a couple of things that I’m not fond of. The story is set in modern day, and therefore the teenagers text – with all the abbreviations and acronyms and what not that is probably 100% typical. However, I can’t stand it. I almost physically cringe when I read over the texts with too many 2’s and U’s. My other issue is the reinforcement of how “bad” the bad boys are. Not only do they look mean, but they have tattoos, and piercings, and more. It’s driven home and I feel we don’t need so many reminders. It is told from the point of view of a teenage girl though, so I guess maybe it’s to be expected. Overall, I thoroughly enjoyed Alice in Zombieland, and I’m excited to see how the story continues in Through the Zombie Glass. Actually, I’ve already started reading it! I went to the theater and saw Jurassic World with my nephew not long after it came out. When we were leaving he asked me what I thought of it, and I replied with something akin to “It’s not Jurassic Park.” He scoffed at me, as teenagers do, and we continued on our way. I had trouble explaining to my nephew just what it was that was off for me, I just knew it wasn’t Jurassic Park. I didn’t have the same feelings watching Jurassic World as I did with Jurassic Park. Later, I went and saw Jurassic World again with my best friend, and at the end of the movie asked her what she thought and related the above anecdote. She asked me what I meant, and I kind of thought here we go again, since I’d already had trouble explaining this difference once. However, she understood what I was trying to explain, and was able to sum it up nicely. Jurassic Park is a suspense movie, and Jurassic World is an action movie. When I heard her say that I exclaimed “Exactly!” That was the difference I was trying to put my finger on, and couldn’t quite articulate. Part of the problem for me was that I don’t think I’d ever tried to categorize Jurassic Park. When explaining it I described the sense of tension I felt throughout the movie, and that’s what lead to the categorization of a suspense movie. Now, all that being said, even though I didn’t have a concise categorization of Jurassic World, I enjoyed it much more the second time through. I knew what to expect and I wasn’t going in thinking it would have the same kind of feel as Jurassic Park. Chris Pratt as Owen Grady is easily the best part of Jurassic World. I also liked Lowery (who I thought was named Larry until I caught his name in the credits after the second viewing). My favorite dinosaurs were the Velociraptors, made even better since Owen trained them and the “raptor pack” was able to be born. The “big bad” dinosaur, Indominus Rex, wasn’t bad. She had some cool abilities, but I feel some of the awe and scariness was lost in the way she interacted with the people and the environment. I felt there was a lot more general destruction, rather than hunting. Both movies are a lot of fun, but for me Jurassic Park is definitely the winner.